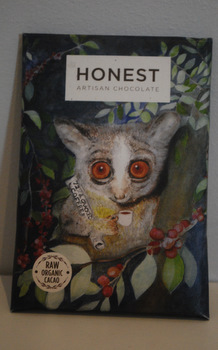 So I popped downtown this week to find Honest Chocolate in Wale Street. Open for just over a month, the store is sandwiched nicely between Bree and Loop, adjacent to Liam Mooney. It’s a modest operation and as the name implies, has honest intentions. Importantly, the chocolate tastes damn fine in the way an artisanal product should. This is why I paid R42 for a slab. Impressions? What you see is what you get. 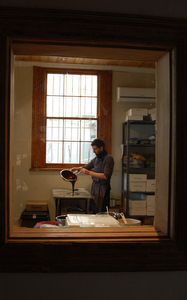 Owners Michael and Anthony make, temper and dip their chocolates by hand, and employ a small team to help. Their product is organic, and so is their small operation. They recently bought an old-fashioned cash register… next investment is air-conditioners because summer temperatures aren’t very chocolate-friendly. The chocolate is of a really high standard, yet it’s also “healthier” than most commercial brands. I’m inherently suspicious of products made for their health benefits because flavour and quality are the most important criteria to sway me. Michael reckons people buy their chocolates because they like the taste, a good thing. This company is not shy to punt the healthful attractions of their product on the packaging but as Michael points out chocolate is never going to be as healthy as spinach. The chocolate beans aren’t roasted so the raw state retains more anti-oxidants and minerals. It’s organic, can be eaten by vegans, the lactose-intolerant and – in small quantities – by diabetics. Natural plant fructose - agave liquid - replaces sugar. Vanilla bean is also used. There are no dairy products – organic, cold-pressed coconut oil replaces cream or stodgy commercial fillers in the tasty truffles also produced. The four slab types all use 72% chocolate as a standard. The other three have the addition of Karoo salt – the Dessert salt bar - cocoa bean nibs, and Peru maca root respectively. Maca root from Peru is said to be an energy-enhancing superfood with potential libido-enhancing benefits - believe it if you will. Organic chocolate spread (R48) and truffles (R10 to R12) in original chocolate, honey, mint and coffee flavours are also available. I was given an original truffle to take away. It’s pretty good, but I remain a sucker for slabs.